You are invited to join Attar Mist UK for the #Christmas #Shopping Evening. 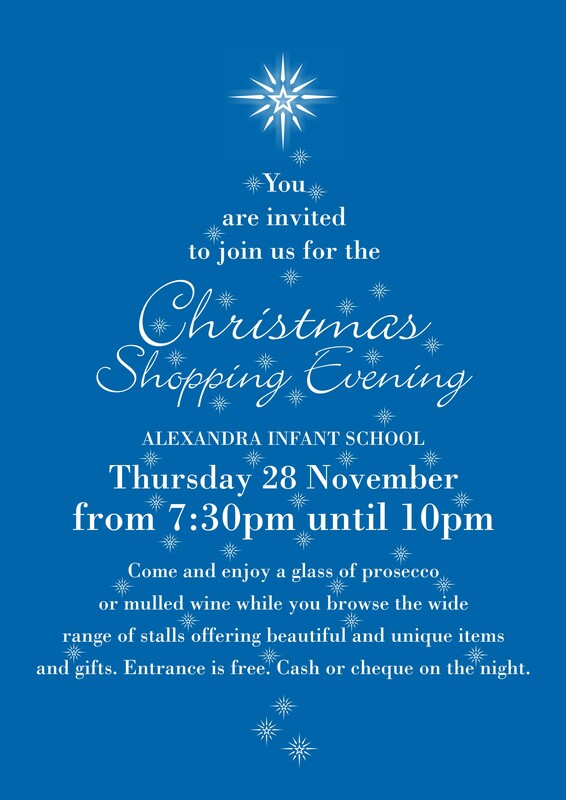 If you happen to be around #KingstonUponThames tonight then why don’t you come and join us at the Alexandra Infant School, KT2 6SE. It’s a chance to smell all our #Perfumes #FragranceOils #EssentialOils & #Incense. We can put together perfect #gifts for you and your loved ones for the #HolidaySeason. The school will be decorated with icy blue Christmas theme to get you in the #festive mood. Lots of other #stalls will be vending there as well from #jewellery, #crafts, #gifts and #stocking fillers. See you all there. Remember you can always purchase all our products from our website. With you collection, you cant go wrong. Follow us on Facebook, Twitter, Pinterest & Blog. The Global Peace and Unity Festival have established itself as the largest gathering of its kind across Europe, with over 100,000 attendees in 2010. This year much bigger crowd is expected and Attar Mist would also be participating. Come and visit us at the stall A68. We will be bringing a vast collection of attar, perfume oils, essential oils, Oudh collection, bakhoor and more. So don’t miss out on the opportunity to stock up on your favorite fragrances or perhaps just an opportunity to buy a gift for your loved one. With our selection, you can’t go wrong. You can also speak to our representative on the day for retail opportunities. Golden Sand is an exotic enticing Arabian perfume oil which is winning the admiration of customers of all ages. Its gorgeously sweet honey notes are touched with warm vanilla ending in mellow musky notes. Take pleasure and delight in wearing this deliciously sweet glowing fragrance that will soon become your favorite. Due to its versatility as a unisex fragrance that is loved by all ages, it will make a perfect gift for any occasion! Available in 3 sizes and also in crystal perfume bottle, you can buy as much or as many as your heart desires! As with all our perfume oils at AttarMist.co.uk, Golden Sand is free of alcohol and due to their concentrated form, stay on wearer longer than conventional perfumes. Meena Bazaar 2013 – Time for Glasgow visit again! 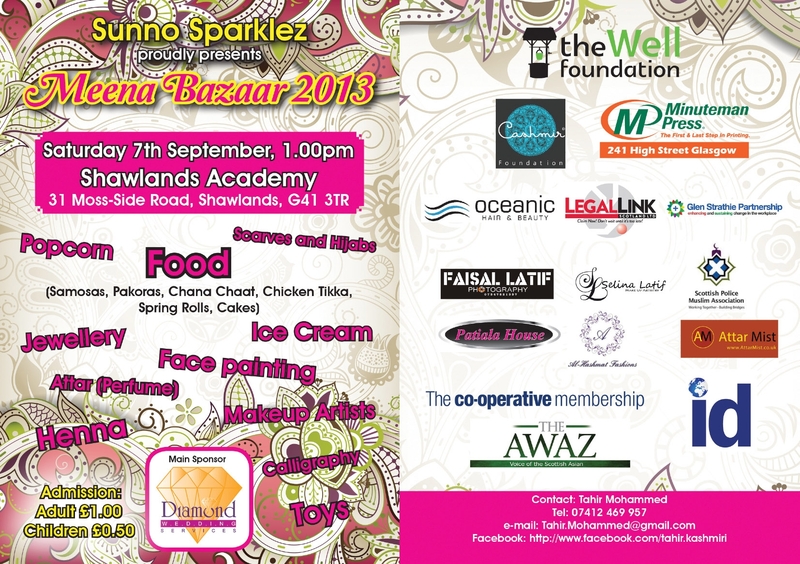 After two very successful events in Glasgow UK (Multi-cultural Festival and Awaz FM Eid Bazaar), we are returning again for a splendid Meena Bazaar at Shawlands Academy on 7th September 2013. As always we will be bringing our best collection of attar, perfume oils, essential oils, Oudh collection, bakhoor and more. So don’t miss out on the opportunity to stock up on your favorite fragrances or perhaps just an opportunity to buy a gift for your loved one. We are also the proud silver sponsors of Meena Bazzar 2013 which has been organized by Shawlands Academy and Partnered by Well Foundation Charity. Buy beautiful attar and perfumes from Attar Mist at the Meena Bazaar 2013. Attar Mist is coming to one of the biggest family festival in London UK. We will be vending at the London Mela which is supported by the Mayor of London, produced by London Borough of Ealing and in partnership with London Borough of Hounslow. We will be bringing our fabulous collection of Attar perfume oils, finest Oudh collection and much more. Make sure you visit our stall to find your own fragrance. With our selection, you can’t go wrong. Attar Mist will be coming to the UBL UK Birmingham Eid Mela this Bank holiday Sunday, 25th August with all the delightful attar and incenses. This is the 13th year of the festival. 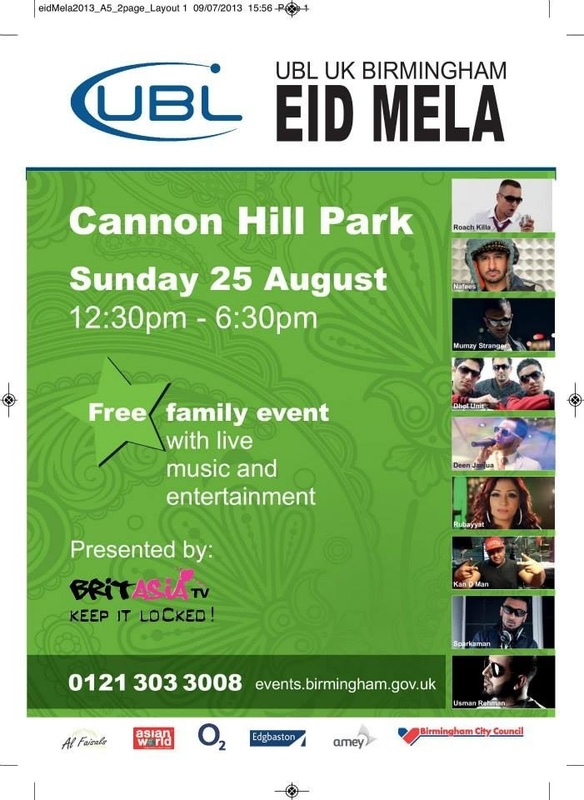 It’s a part of the city’s annual programme of cultural events & festivals and around 20,000 people from Birmingham and beyond are expected to attend. We will be bringing our finest perfume oil & fragrance oil summer collection for you so why not come and visit our stall to find your own fragrance or for an enchanting gift selection for your loved ones. Attar Mist is a great place for gifts and treats. Our Oudh selection and fancy bottle fragrances are sure to please the ones close to you. With our selection, you can’t go wrong. 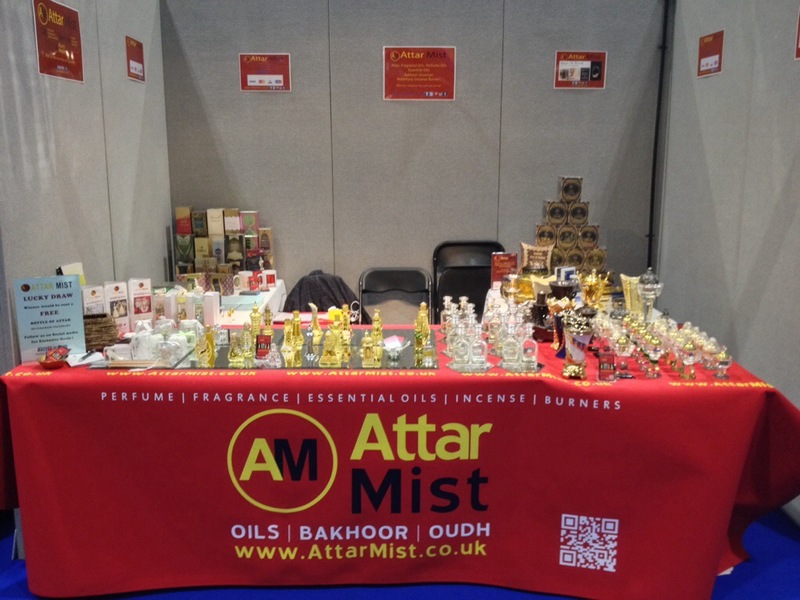 Attar Mist in Glasgow this weekend! For all our lovely Glasgow customers! Attar Mist is returning to Glasgow this weekend. 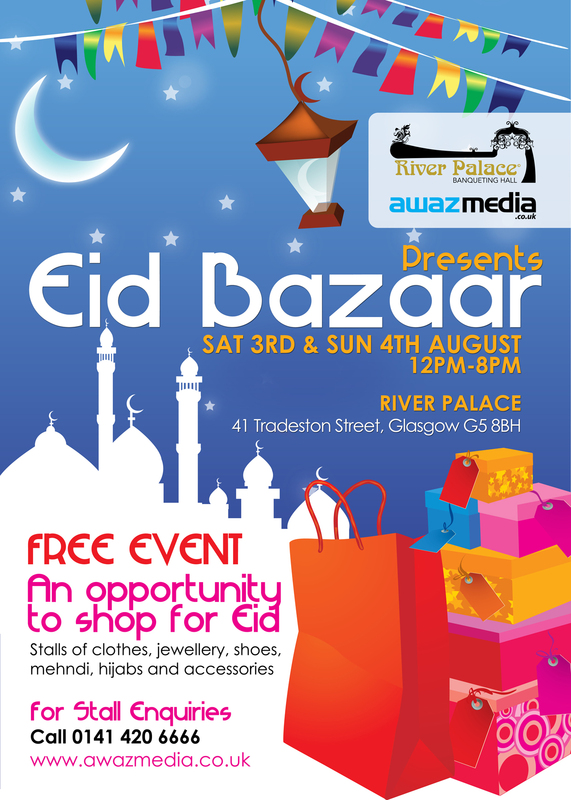 We have been kindly invited by radio channel Awaz FM Scotland to join them in their Eid Bazaar for last minute shopping ideas for yourself and great gift for your loved ones. It’s a two days bazaar and we will be vending on both days with our wide selection along with some new items. Hope to see you all there on both days.